From its beginnings in the late 1970s, the Religious Right has expressed hostility toward America’s open, secular society and made no secret of its desire to transform the country into an explicitly “Christian nation.” Given its controversial views, it is remarkable how little attention has been given to the ideology that shapes its thinking. Blueprint for Theocracy is the first book to explore fully the nature and origin of the Religious Right’s highly charged ideas. It traces the movement’s belief system, commonly called “Christian Worldview,” to four Christian thinkers known for their theocratic and authoritarian doctrines. These doctrines, modified and assimilated by the movement in recent years, have been conveyed to the faithful through textbooks, lectures, and seminars. The book goes on to examine in depth how the Christian Right uses the ideology to further a broad political and cultural agenda. It shows specifically how the ideology promotes a concept of “total truth” unique to biblical Christians that enables them to redefine freedom, law, government, and even history and science, in their own infallible terms. A vision for the future and plan of action are formed on the basis of these certainties. The book concludes by discussing the danger the ideology poses to democratic society and offers intelligent ways of confronting it. 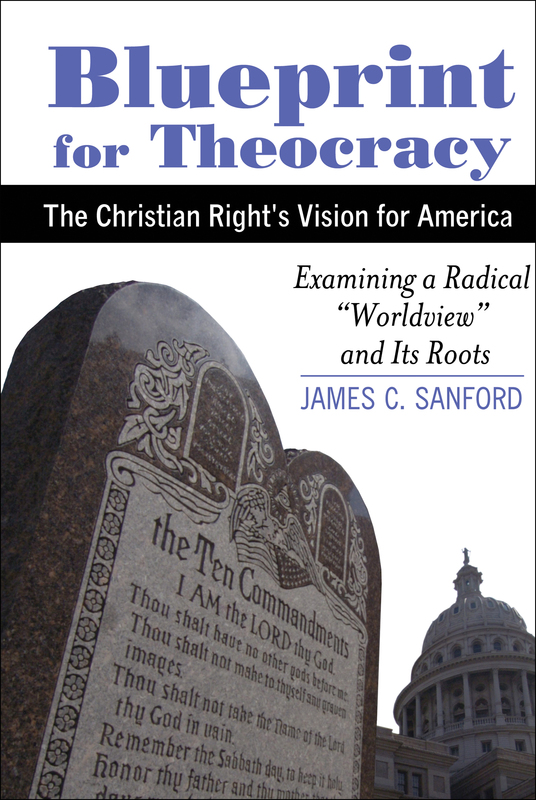 Blueprint for Theocracy exists in hardcover, softcover, and e-book versions. Category: Politics/Religion. Publisher: Metacomet Books. Specifications: 288 pages, footnotes, glossary, and index. Published in 2014. Orders: Available online at Amazon and Barnes & Noble, and at many local outlets. For those interested in signed copies (at the cover price of $18 for softcover and $26 for hardcover), contact us at sanfordexpress@gmail.com. 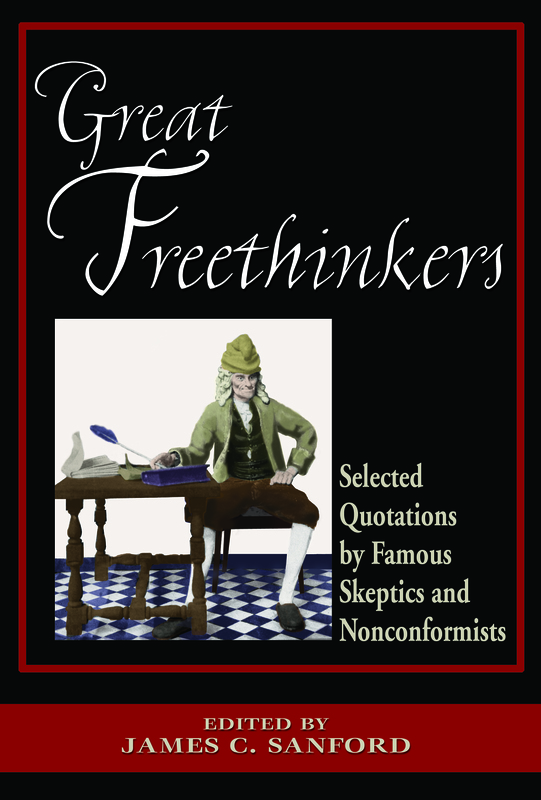 Great Freethinkers is a book of more than 1,000 irreverent and wise quotations by men and women who were not afraid to challenge conventional notions of God, country, and culture. Included are truth seekers from Heraclitus to Albert Einstein, and heretics from Thomas Paine to Edward Abbey. Almost 200 men and women are represented here. It is the first book to feature the opinions of freethinkers not just on religion, but on politics, science, and the whole range of human issues. The term “freethinker’ broadly designates one who thinks independently and questions accepted norms and traditions. There is no single “creed” of free thought, as shown here by the inclusion of atheists, agnostics, unconventional theists, liberals, anarchists, and socialists. Their quotations have been gathered under 45 topics, carefully attributed and referenced, and placed chronologically under each topic. Entries have been chosen for their incisiveness, depth, and wit. It is hoped that readers will find this both a stimulating read and a useful reference tool for future exploration. The book, originally published in 2004, has since been included in Margaret Downey’s “Tree of Knowledge” list of key readings on free thought. Great Freethinkers is available in both hardcover and softcover editions. Category: Philosophy/Religion. Publisher: Metacomet Books. Specifications: 264 pages, index. Published in 2004. Orders: Available online at Amazon, mostly used copies. For those interested in new and, if desired, signed copies at the cover price of $15 for softcover and $23 for hardcover, contact us at sanfordexpress@gmail.com.